Leather has become a very popular furnishing material with many different finishes. It is often sold as easy maintenance which encourages people to feel that no maintenance is needed at all. High quality leather upholstery can be a significant purchase and should be regularly protected and annually cleaned in order to maximise its life span and enhance its appearance. Many do-it-yourself home cleaning remedies can cause damage and age your furniture prematurely. Leather is porous and can absorb body oils, food and liquid spills. Without regular application of protector, and correct cleaning, your furniture can be exposed to damage. How does your leather furniture look? We determine the type of leather, the level of soiling, whether there is damage and advise on the best way to preserve the appearance. Leather is porous and needs regular application of protector to preserve the surface and keep it supple. We clean and protect your valuable leather furniture by hand. Soil extraction: We carefully vacuum then wash your leather using a special mild leather cleaning solution. This key step in the cleaning process removes soil and grease adhering to the leather by gentle agitation with a soft sponge. We remove all traces of dirt, grease and soil from the surface to prepare the leather for the conditioning treatment. Conditioning and Protecting: We then apply a leather protection cream. This feeds, nourishes and protects, reducing drying and cracking. This helps the surface resist daily soiling and penetration of oils and spills. All new leather furniture should have a leather protector applied before use. Each job comes with a 100% Money Back Guarantee. We personally ensure that you are 100% delighted with our work, EVEN if after we've left your home you are in any way dissatisfied we will re-clean for free. If you are still unhappy we'll write you a cheque for every penny you have spent with us. 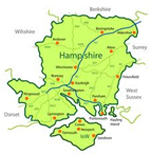 Located in Fareham, Hampshire, we currently operate in a 25 mile radius. To get in touch with us and find out how we can help please fill out the contact form above.